The Milwaukee Brewers entered spring training with one of Major League Baseball’s deepest and most dynamic bullpens. So how is it now, with less than one week remaining until their regular season begins, that the potential signing of an elite closer like Craig Kimbrel has become a near necessity, rather than a luxury? The injury bug has bitten the Brewers. That’s how. 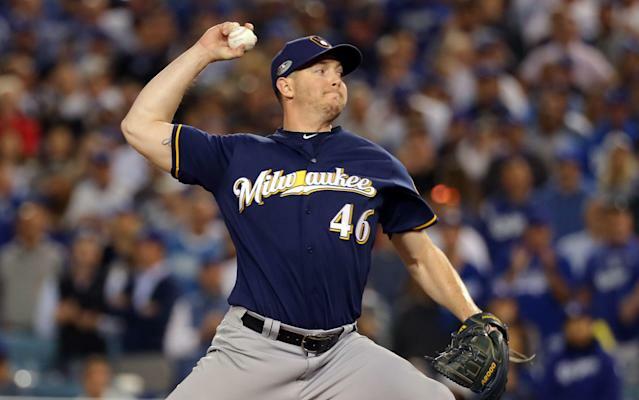 As we’ve learned this week, Milwaukee will begin the season without two high-level, late-inning relievers in Jeremy Jeffress and Corey Knebel. Those losses will force manager Craig Counsell to restructure bullpen roles and vastly rework his strategy in terms of how and when he’ll deploy bullpen ace Josh Hader. A depleted bullpen also puts more pressure on a Brewers starting rotation that might not be equipped to handle a heavier workload. In other words, these injuries change everything. The question now is, for how long? On Tuesday, Counsell confirmed that Jeffress, his closer at the end the 2018 season, would begin 2019 on the injured list due to a sore right shoulder. Then came word on Thursday that Knebel, Milwaukee’s former closer and now top setup man, has a partially torn UCL and will be getting a second opinion to help determine what treatment might be needed. Corey Knebel’s elbow injury is a UCL issue, Craig Counsell said. He will go for a second opinion. It’s not a complete tear and it’s not definitive that he needs TJ surgery, Counsell suggested. Even when there’s some semblance of optimism, Tommy John surgery entering the conversation is always ominous. The hope is that Jeffress and Knebel’s absences will both be short ones. The reality is, either way, they will definitely be felt. Jeffress, in particular, was lights out last season, posting a 1.29 ERA while striking out 89 batters in 76 2/3 regular season innings. He was less imposing during the postseason, allowing six runs in eight innings while blowing a pair of save opportunities. But the Brewers were confidently counting on him to close again. As for Knebel, he took a small step back last season after racking up 39 saves as Milwaukee’s closer in 2017. However, he did finish 2018 strong in his new set-up role, going the entire month of September (16 1/3 innings) without allowing a run. Because of Jeffress and Knebel's late success, Counsell could better plan when he wanted to use Hader, who by the way set the MLB record for most strikeouts by a left-handed reliever with 143. Now he might have no choice but to save Hader for the eighth or ninth inning. 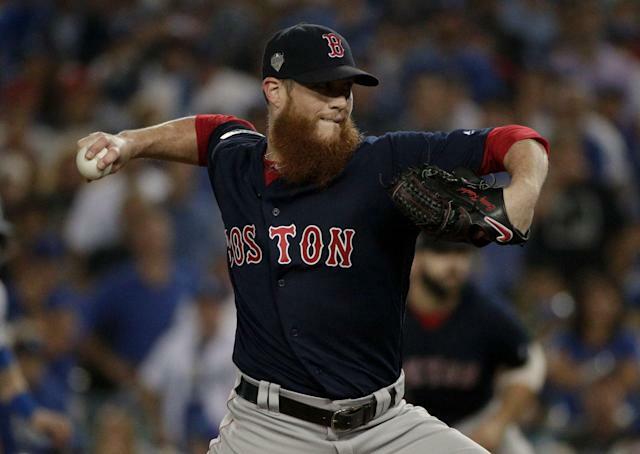 It was reported earlier this week that the Brewers and Kimbrel were in discussions about a potential deal. What didn’t make as much sense then, makes a ton of sense now given the injury news. Signing Kimbrel would make life much easier for Counsell. In addition to restoring some of the order last season’s bullpen established, it would also provide insurance in case Jeffress, Knebel or both end up missing extended time. The old saying about never having enough pitching depth comes to mind here. Kimbrel, 30, has been one of MLB's premier closers since taking over for the Braves full-time in 2011. He's notched 333 career saves, racked up 868 strikeouts (in just 532 2/3 innings), earned seven All-Star selections and pitched in six postseasons. He brings instant stability to the ninth inning. Honestly, that's something at least half the league could use, but the Brewers are now poised to join that list. Can the Brewers sign Craig Kimbrel? The issue for Milwaukee is the same issue that has kept Kimbrel on the market all winter long. He’s looking for anywhere from $85 million to $100 million over four or five seasons, according to various reports. Tom Haudricourt of the Milwaukee Journal Sentinel suggests the Brewers’ projected $125 million payroll — which is already the highest in franchise history — is stretched after the Yasmani Grandal ($18.25 million) and Mike Moustakas ($10 million) signings. Unless Kimbrel’s price tag comes down or the Brewers can craft a creative deal, he’ll be difficult to squeeze in. Will the circumstances and the Brewers’ expectations be enough to make them change course on payroll? That’s a question they might be forced to answer in the coming days. But the answer to what ails them is pretty simple. Sign Craig Kimbrel.